Female of Heriades (Heriades) truncorum (Linnaeus, 1758) collecting resin on the bark of a pine. Foto A. Krebs. The genus Heriades has a wide distribution, it occurs in the Palaearctic, the Nearctic, the Afrotropical and the Oriental region. 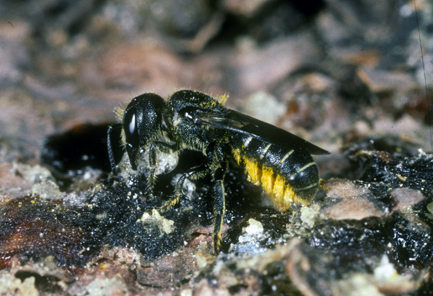 Recently, one species of the subgenus Neotrypetes has been discovered at the Carribean coast of Colombia being the first record of an osmiine bee for South America (Gonzalez and Griswold, 2011). Currently, there are 137 described Heriades species worldwide, 22 of which occur in the Palaearctic. At least 24 extra-Palaearctic and 5 Palaearctic species are still undescribed. Information on the nesting biology is available for 14 Heriades species belonging to three subgenera from the Afrotropical, Nearctic, Neotropical, Oriental and Palaearctic region (A. Müller, C. Praz, J. Neff, G. Le Goff and C. Sedivy, unpublished). The great majority of the species nest in preexisting cavities, mainly in insect burrows in dead wood or in hollow stems. The females of H. (Heriades) spiniscutis (Afrotropical) and H. (Michenerella) othonis (Oriental) are assumed to occasionally excavate their own burrows in pithy stems (Lieftinck, 1954; Michener, 1968). Both cell partitions and nest plug are constructed from resin. In H. (Neotrypetes) variolosus (Nearctic), the cell partitions are composed of two distinct areas: the outer ring consists of mud, the inner surface is made of resin (Fischer, 1955). In H. (Heriades) spiniscutis, cell partitions are sometimes lacking (Michener, 1968). Many species integrate tiny pebbles, sand grains, wood fibers or other small particles in the outer surface of the plug, sometimes also in the cell partitions. The Palaearctic species of the subgenus Heriades as well as the only species of the subgenus Rhopaloheriades show a close affiliation to flowers of the Asteraceae. Several species are strictly oligolectic on this plant family. In contrast, the few Palaearctic species of Michenerella, for which flower records are available, appear to be polylectic. The females of an undescribed Michenerella species from the United Arab Emirates are equipped with specialized bristles on the labial palpi of the proboscis, which most probably serve to scrape pollen out of the narrow-tubed flowers of Heliotropium (Boraginaceae) (A. Müller, unpublished).